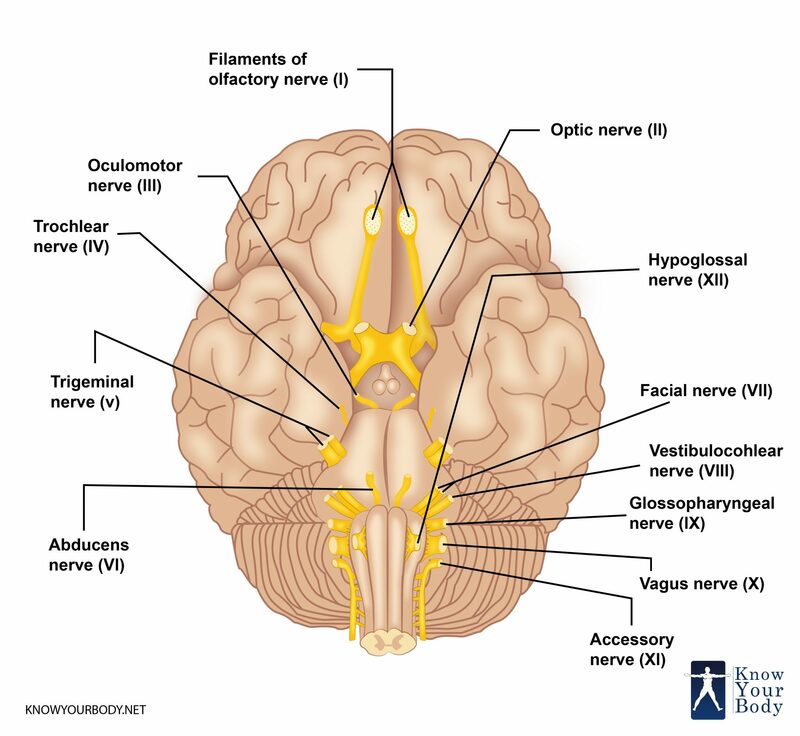 Also called as CN1, the olfactory nerve is among the first of 12 cranial nerves situated in the head. It transmits sensory data to brain and aids in sense of smell. The olfactory receptor neurons contain afferent nerve fibers that transfer nerve impulses regarding odor or smell to the central nervous system. This nerve is unique as compared to other cranial nerves as it holds some power of regeneration when damaged. This nerve is sensory in nature. The sense of smell such as the sense of taste constitutes part of the chemosensory system, also known as chemical senses. The potential to smell comes from special sensory cells, known as olfactory sensory neurons that are found in a small tissue patch inside the nose. There is one odor receptor in each olfactory neuron. This nerve is located in the head and originates from olfactory mucosa present in the upper region of the nasal cavity. The olfactory receptors of the nerve are situated within the mucosa of the nasal cavity. Unlike other nerves, this nerve does not hold two trunks. Instead, it contains sensory fibers extending from the cribriform plate of the ethmoid bone, which is part of skull situated behind the nose. When any particles or airborne chemical enter into the nasal cavity, then they come in contact with these neural receptors. Despite being a component of the nervous system, the olfactory nerve does not link the brainstem. This nerve is the shortest cranial nerve in the human head. Central processes that send information back to the brain. Peripheral olfactory processes that are receptors present in the olfactory mucosa. 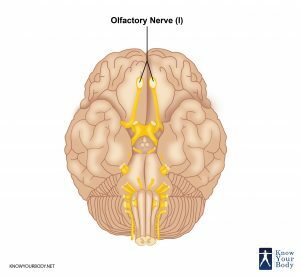 The olfactory nerve’s anatomy comprises of various parts that are involved in smelling an odor and transmitting the signals to and from the brain. The olfactory neuroepithelium is situated in the upper region of each nasal chamber close to the cribriform plate, superior-lateral nasal wall, and superior nasal septum. It is a special pseudostratified neuroepithelium comprising the primary olfactory receptors. This region is a dense neural sheet, but in small children as well as adults, the olfactory and respiratory tissues interdigitate. With aging the numbers of olfactory neurons decreases. Besides this, the olfactory epithelium is prepared from supporting cells, basal cells, ducts, and Bowman glands that enable regeneration of the olfactory nerve. This is a spongy and light bone comprising a horizontal plate, two lateral walls, and a perpendicular plate. It houses a very thin mesh and fragile bone. It includes thousands of small holes through which the olfactory neuron’s axons pass into the brain. When there is a sudden blow in front of the head then it knocks the cribriform plate out of its location, causing the delicate olfactory axons to shear off. With the cutoff, the olfactory nerve appears dead and hence the sense of smell is destroyed. It is the part of the respiratory passage in either area of the nasal septum. The cavity is placed with nasal mucosa and contains olfactory cells. The nasal cavity is divided into two distinct chambers. These are small-sized and blueberry-shaped extensions from the brain, for each nostril. As per their anatomical structures, these are situated in the forebrain that receives neural input regarding odors that have been identified by cells within the nasal cavity. The olfactory receptor cell’s axons extend into the olfactory bulb. It is responsible for transmitting smells from receptors to the nose. A range of neurons extends from olfactory cortex down to thalamus. They may result in odor sensation that happens at the level of our nose and olfactory bulb. It is the connective tissue that includes supporting cells and receptor cells. It is in the form of two patches of yellow mucus membrane about 7cm from each nostril. The sensation of smell is mediated through stimulation of olfactory receptor cells through volatile chemicals. To boost the olfactory receptors, it is essential for airborne molecules to pass through the nasal cavity with quite turbulent air currents and link the receptors. It is possible to perceive odorants by entering the nose through nasopharynx to pass through retronasal olfaction and reach the olfactory receptor. This process plays a key role in the sensation of flavor during drinking and eating. Each olfactory receptor cells is mainly sensory bipolar neuron. On an average, a nasal cavity contains more than 100 million neurons. These neurons are specialized because they are generated throughout life by the basal cells. New cells are regenerated approximately 30 – 60 days. The core function of the olfactory nerve is to sense the smell. Partially, it is also responsible for the sense of taste. 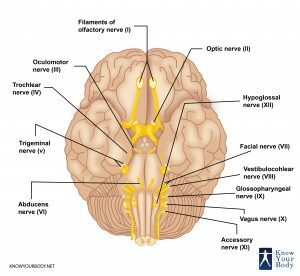 This nerve is known as cranial nerve 1 as it is the smallest cranial nerve and one of the two nerves that bypasses the stem of brain and links directly to the brain. Another important function of the olfactory nerve is to identify chemicals present in the air and transfer information about the same to the brain. Hence, whenever you experience any bad smell around then it is the olfactory nerve that transmits the information to the brain. The olfactory nerve contains epithelial cells that are very specialized. These are powerful cells that are covered with small hairs known as cilia. These cells are linked to an axon, which is the main nerve cell of the body. The functional partners of the olfactory nerve are special visceral afferent or SVA that carries the signals of smell. Anosmia – It is the absence of sensation of smell. Dysomia – It is the distortion of the sensation of smell. Hyposmia – It is decrease in the sensation of smell. Cacosmia – It is the sensation of foul or bad smell. Parosmia – It is the sensation of smell when there is lack of appropriate stimulus. Dysfunctions of the olfactory nerve can lead to certain syndromes, like Kallman syndrome, which is hypogonadism. It can also lead to Foster Kennedy syndrome that is papilledema, optic atrophy, and unilateral anosmia usually linked to an olfactory groove meningioma. The conventional description of partial intricate epilepsy with small temporal focus consist an aura of awful smelling odors that happen before the onset of a seizure. The dysfunction of the Olfactory nerve is linked with early Parkinson disease as well as other sorts of neurodegenerative disorders, like Huntington chorea and Alzheimer disease. A link also exists between abnormal olfactory identification as well as obsessive-compulsive disorder. The trauma of head resulting in fracture of the cribriform plate can cause cerebrospinal fluid rhinorrhea and a meningitis potential. Paranasal sinus endoscopy may result in a violation of cribriform plate and other infectious complications. The structure of olfactory nerve can be injured because of craniotomies involving anterior cranial base that can disrupt the fine and small fibers of olfactory nerve. A loss in the potential to smell or alteration in the way odors or smells is perceived is known as an olfactory disorder. Diminishing the sense of smell is known as hyposmia. The total inability to detect odors is known as anosmia. When there are changes in the perception of odors, few people might notice that few odors would become distorted. There can be numerous causes of smell disorders. Most of the individuals who have developed this disorder have experienced an injury or illness. Some common triggers for smell related issues are colds and infections in the upper respiratory system and head injuries. In addition to this, the other causes of smell issues are polyps in nasal cavities, hormonal disturbances, dental problems, sinus infections, and aging. Exposure to certain types of chemicals like solvents and insecticides as well as consuming some medications can also lead to smell disorders. People suffering from neck and head cancers who obtain radiation treatment can also experience problems with the sense of smell. When there is damage to the nerve then this can lead to such smell impairments. The lesions in olfactory nerve can happen because of blunt trauma. Disorders of the olfactory nerve can lead to serious consequences. The lack of sense of smell is often the first warning signal that alerts us to the smoke, fire, or odor of natural gas leak, and loss of dangerous fumes. This can result in severe health problems, like obesity, hypertension, diabetes, Parkinson’s disease, malnutrition, multiple sclerosis, Korsakoff psychosis, and other issues. If the doctor determines a patient with loss of smell to occur because of allergies or other inflammatory ailments, then he would suggest oral steroids and antihistamines to reduce the inflammation. Before offering any treatment to olfactory disorders it is first essential to treat specific causative abnormalities, which needs to be identified from diagnostic tests, physical examination, and history. Sinus conditions or local nasal must be optimally managed with decongestants, antibiotics, saline lavage, antihistamines, and systemic steroids. Sinus disease and polyps that holds resistance to medical management must be surgically addressed to eradicate the conductive defect. It is essential to exercise care during surgery to avoid any type of damage to olfactory areas. It would be advised to carry aggressive treatment of such disorders to offer a good chance of improvement. There must be specific treatments offered to sensorineural olfactory issues that have fewer chances of success. Usually, viral procedures damaging the olfactory neuroepithelium, multiple sclerosis, and sarcoidosis don’t have specific remedies. However, the doctor would suggest some steroids in order to limit inflammation. The doctor would suggest surgery if the patient is identified with nasal polyps, deviate septum, chronic sinusitis, and other issues treatable with surgical measures. But despite medical and surgical measures, there are certain olfactory disorders that are difficult to treat. Absolute evaluation and treatment of clear rhinorrhea are performed for those for whom CSF is suspected. Initial examination of fluid for glucose claims CSF is not confirmatory. The Computed Tomography of CT scanning is done with radionuclide and cisternography scans in order to detect CSF leakage from anterior cranial fossa. Functional Magnetic resonance imaging or MRI and Positron Emission Tomography or PET scanning are promising to aid in making the diagnosis of distinct sorts of hyposmia as well as delineation of limbic structures like odor recognition, integration of multisensory inputs, and memory. Is it possible to regenerate the olfactory nerve? There are few smell problems, which are treatable, but most of them are not. Such cells pick up odor molecules in the nose and transfer scent messages to olfactory bulb of the brain. Even a simple head blow can tear or injure the olfactory nerve. In such cases, the olfactory nerve cells regenerate but may always be not able to reconnect properly in the brain. How is Olfactory nerve tested? When a patient is tested for his olfactory nerve then a small test is performed to identify his sense of smell. The doctor asks the patient to place his index finger over one nostril to block air. Then he or she closes the eyes. Smell is considered intact when patient identifies an odor. What is the life of olfactory neurons? As per majority of the results, the olfactory neurons live for at least 3 times the commonly accepted lifespan of 30 days. How many olfactory receptor neurons human have? Humans have approximately 1000 distinct genes that constitute ORs. This makes them the biggest gene family. An odorant dissolves into the mucous of olfactory epithelium to bind OR.